Researchers from Johannes Gutenberg University Mainz (JGU) and the Julius Maximilian University of Würzburg are proposing potential new active substances for treating the dengue virus. Just like Ebola, dengue fever is also caused by a virus for which there is currently no cure and no vaccine and can be fatal. In the quest for medication to treat the dengue virus, the scientific community is focusing on a particular enzyme of the pathogen, the protease known as NS2B/NS3. The reason for this is that inhibitors of similar proteases have been revealed to be very effective with other viruses. Protease inhibitors are already being used successfully in the treatment of HIV and Hepatitis patients. There are also several inhibitors for the dengue protease. However, at best, they stop only half of the viruses from multiplying, which is not enough for clinical applications. 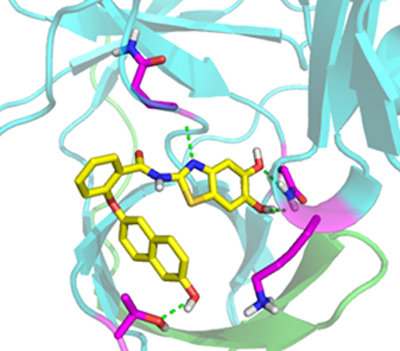 The Würzburg team led by virologist PD Dr. Jochen Bodem, in collaboration with scientists from Mainz University, has discovered far better inhibitors, which are now presented in the journal Antimicrobial Agents and Chemotherapy. "We have developed seven good to very good inhibitors from the diaryl thioether class of molecules, and two of these are even really good," said Bodem. When these two are used, only around three percent of the virus population in a cell culture survives even with very low concentrations of the active substance. From the point of view of science, this is a very good result, especially as the inhibitors, as desired, are highly specialist: they only target dengue viruses and have no impact whatsoever on very close relatives like the Hepatitis C virus. The new active substances were developed by a team of virologists and pharmacists. From Mainz, Professor Tanja Schirmeister and, in particular, her colleague Hongmei Wu, were involved. Schirmeister's team synthesized the inhibitors and then examined and further developed their interactions with the enzyme using computer-assisted methods. On Jochen Bodem's team, Stefanie Bock, who is now working towards a doctorate at the University of Münster, played a key role. Here the protease of the viruses was obtained and cleaned. The effect of the active substances on the dengue virus was later demonstrated in the safety laboratory. As a next step, the scientists will check whether the new active substances have negative effects on higher organisms and whether they inhibit viral replication there as well. Dengue fever originated in the tropics. However, for a few years now it has also been found in other warm regions of the world, such as the Mediterranean. Scientists are attributing this to climate change: the mosquitoes that transmit the virus to humans are able to expand their habitat thanks to increasing global warming. Back in 2010, the Robert Koch Institute reported on dengue fever in southern France and Croatia. In Germany in 2013, there were a total of 879 recorded dengue patients – all travelers who had become infected in the southern hemisphere and in tropical countries. The World Health Organization (WHO) estimates that the number of infections globally stands at 390 million a year. In 1970, infections occurred in just nine countries. These days, that figure has already risen to over 100. The virus is transmitted by the tiger mosquito and other mosquitoes. Usually the infection goes unnoticed since there are no signs of the disease in almost 90 percent of cases. In the remaining cases, an influenza-type illness develops, which may take a potentially fatal course, especially in children. In addition to muscle and bone pain accompanied by a high temperature for days, the patient then develops internal bleeding and other severe symptoms. Without intensive medical treatment, around half of these sufferers die. The interactions of the protease inhibitor (yellow) with the enzyme were analyzed using computer-assisted methods.